A fever blister is a sore from an infection caused by the herpes simplex virus, characterized by an eruption of small and usually painful blisters on the skin of the lips, mouth, gums, or the skin around the mouth. A fever blister is highly contagious. A canker sore is a benign, open sore in the mouth, which appears as a painful white or yellow sore (ulcer) surrounded by a bright red area, which is not contagious. 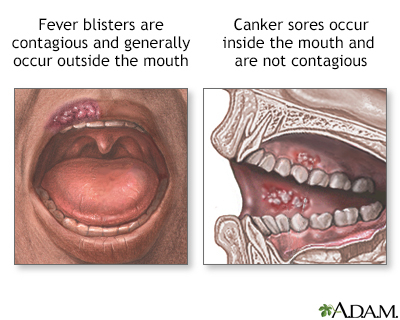 A fever blister is very different from a canker sore, although they both develop in close proximity in area of the mouth.